Mr. William Goldsborough of the Chesapeake Bay Foundation was presented the 2013 Melissa Laser Fish Habitat Conservation Award by the Atlantic Coastal Fish Habitat Partnership for his exemplary work in furthering the conservation, protection, restoration, and enhancement of habitat for native Atlantic coastal, estuarine-dependent, and diadromous fishes. The award was presented last week at the Atlantic States Marine Fisheries Commission’s 72nd Annual Meeting in St. Simons Island, Georgia. Mr. Goldsborough was one of the earliest members of the Commission’s Habitat Committee and its longest serving chair, having served in that position for 10 years. Under his leadership and participation, the Committee developed habitat sections for many of the Commission’s interstate fishery management plans and released numerous publications – all of which have elevated understanding of habitat and its critical link to supporting abundant fisheries. 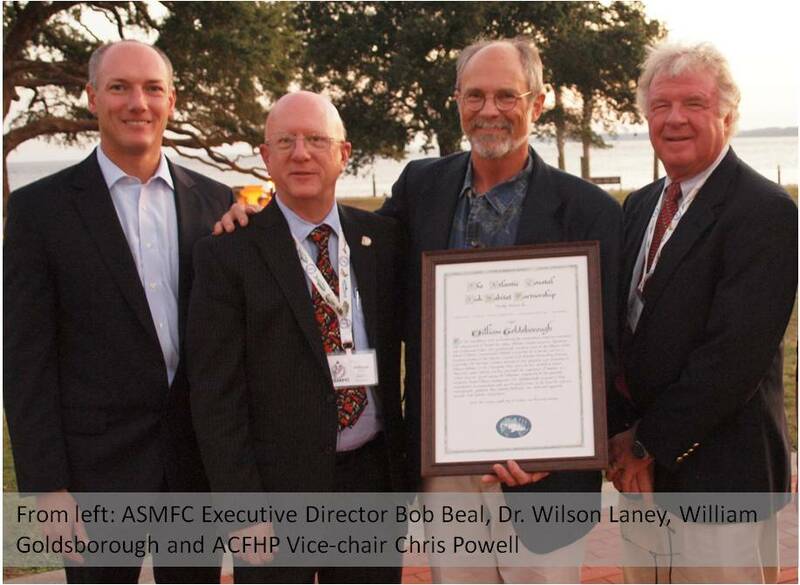 He was also a founding member of the Atlantic Coastal Fish Habitat Partnership Steering Committee, a partnership of state, federal, tribal, and non-governmental groups whose mission is to conserve habitat for native Atlantic coastal, estuarine-dependent, and diadromous fishes. Throughout his career, he has been a tireless advocate for the protection and restoration of fisheries habitat. In the Chesapeake Bay region, he has worked to restore American oyster habitat and has advanced the importance of habitat as a critical common ground among all fishermen. Coastwide, he has promoted ecosystem-based fishery management. Mr. Goldsborough’s deep commitment to conservation and use of sound science as the basis for resource management fully embody Dr. Melissa Laser’s own dedicated approach towards fish habitat conservation. The award is established in memory of Dr. Melissa Laser, who was a biologist with the Maine Department of Marine Resources, where she worked tirelessly to protect, improve and restore aquatic ecosystems in Maine and along the entire Atlantic Coast. Dr. Laser brought her smiling dedication and enthusiasm to the Atlantic States Marine Fisheries Commission’s Habitat Committee and Atlantic Coastal Fish Habitat Partnership’s Steering Committee, catalyzed by the Commission in 2006. Her contributions to these committees and to her home state were tremendous. For additional more information, please contact Emily Greene, Atlantic Coastal Fish Habitat Partnership Coordinator, at 703.842.0740 or egreene@asmfc.org.